Chef, author and television host Anthony Bourdain (R) and Ottavia Busia attend the 53rd annual CLIO awards at the American Museum of Natural History on May 15, 2012 in New York City. Anthony Bourdain's 11-year-old daughter performed in a concert just days after her father died of an apparent suicide in France. Bourdain's ex-wife, Ottavia Busia, shared a photo on Instagram of their child, Ariane, appearing on stage at a music venue in New York. Busia wrote that their daughter was "strong and brave" and wore the boots that he had bought her. 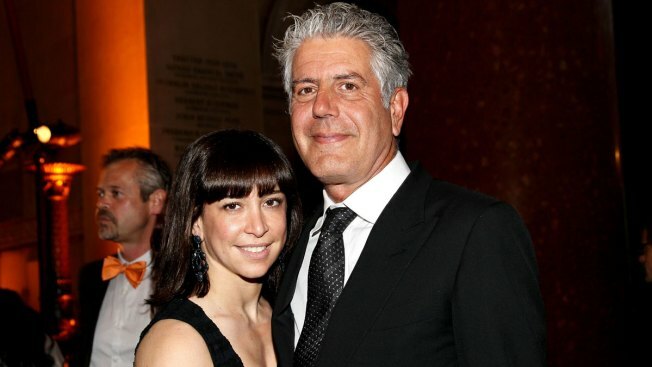 According to E!, the couple of nine years remained amicable after their split with Bourdain telling People in 2016, "My wife and I live, have lived, very separate lives for years...There's no drama here. We get along really, really well and it's not a big lifestyle change happening here." Authorities said the cook, writer and host of the CNN series "Parts Unknown" killed himself Friday in a luxury hotel in France's eastern Alsace region. He was 61 years old.